Botulism is one of all dangerous diseases that can infected duck. This disease is caused by bacteria which can grow inside the body duck. Basically, this disease is same as poisoned case which is the bacteria accidentally eat by duck. Talk about disease, there are so many causes of disease that can attack duck such like bacteria, virus, and fungal. The come from of the cause like bacteria, virus, and fungal can’t be surely known but it can be tracked. For example bacteria, it surely comes of slouchy habit that practiced for long time in their cage. Fungal can also caused by slouchy habit but the temperature is more contributed than the habit. And virus? Well it still deeply observed about this one. Back to the botulism, why this disease become serious? Firstly, the main symptom that appeared is worrying. Something like neck and foot paralyzing and poop problem can makes the duck death suddenly at once. Beside that, the transferred of bacteria also terrible which is the bacteria can be transferred by wound, inhale, and mouth or oral. Well, for monitor a dozen or maybe a hundred duck on one cage to avoid the transferring process shouldn’t easy thing, right? 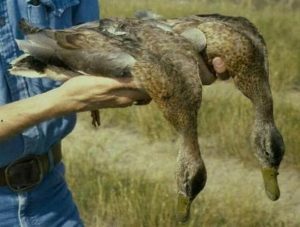 We do know about the dangerous that caused by this disease so to helps you manage the duck, here are some ways how to overcome and prevent botulism. Carrion and rot food are the main source of bacteria that caused botulism. Also, when the duck already affected this disease make sure that you separated away one each other. That’s because this bacteria spreading is really easy so you ma feeling so hard to control it. Before this disease is getting worse, when the symptom appeared you better separate it away as soon as possible. To keeping the duck food is fresh and clean, you can start with right space choosing. Make sure that the place is dry and wide enough to keep the food. Also, make sure that there is the hole that can make rain drop so the drying can be guaranteed. The person who works on the cage also surely must to keep the cleanliness. It can start by washing hand before feed the duck, always change the water drinking every day, and also clean the pound if there is available. The main thing if we talk about cleanliness of poultry, the cage also included. As duck main house, cage also the thing that should be cleaning. For farmer who decide to spread the food over the base cage, you need extra energy to clean it. That’s because the rest of the food can be mixed with their poop which is it surely dirty and not good for ducks. It is the important thing when you choose the design of the cage, you better make sure that the cage also easy to clean. As mentioned before that this disease has terrible transmitted. By wound, oral, and inhale, the bacteria can be spread and infected each other. That’s why you must separate it as soon as possible. Also, if the duck can’t survive and dead make sure that you destroy it by burn to decrease transmission possibility. This ways also used to destroy duck that affected avian-influenza. The poultry must have security system and sanitary as water cycle. Make sure that both of security and sanitary designed for poultry. Developing and management should practice well and sustainable. For complete information including dose you can read it in the packaging. It is actually a laxative, and for complete information you can check the packaging. Giving Epxon 25 gram per one liter of water. This point used to make the duck feels thirsty so they would drink continuously. When the duck drink continuously, the water helps to decrease the toxic inside the duck. This medicine is also laxative and the means of giving this medicine is to makes out the bacteria inside the duck’s body. You can also give antibiotic injections botulismus type C as 2-4 ml into the blood vessels. That’s all the step of overcome and prevent botulism in the duck. There is no thing easy and right when we do something. And there is fail and win that makes you may have to keep try and error for some times. It’s not problem when you do trial and error but make sure that error isn’t mean to kill them deliberately.